Photo is not of this case, but typical of the time. Courtesy of LAPL. 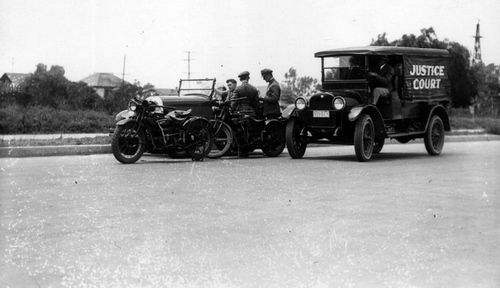 On the evening of July 19, 1922, motorcycle Officer Chester L.. Bandle clocked a coupe speeding through the intersection at Ninth and Hill Streets at a reckless forty miles an hour. He gave chase. The driver pulled over at Seventh and Hill and Officer Bandle walked over to hand the speeder a ticket, but he never got the chance. The driver, aiming a revolver, leaned out of the car and shot Officer Bandle in the right shoulder–then he sped off abandoning the car several blocks away. The car was taken to Central Police Station and Officer Bandle was taken to White Memorial Hospital in fair condition, but expected to survive. The abandoned car was found a few blocks from where the motor officer had been wounded, and a search of the vehicle yielded a few bits of potentially useful information. Charles Mullen, 4124 Washington Street, Fresno, was the registered owner. Was the car stolen? Was the shooter and the owner of the car the same person? It was up to Sheriff’s investigators to find out. Detectives learned that Charles Mullen was one of many aliases used by twenty-seven year-old Edward Burton of Chicago. Burton was well-known to Chicago cops having begun his life of crime there as a teenager. Under one of his aliases, Louis Miller, he was implicated, but never charged, in he 1919 gangland murder of fellow Windy City street thug, Jimmy Cherin. Like many crooks before him Burton decided to head west, at least for a while. 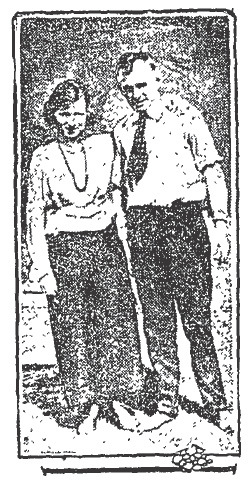 Burton didn’t travel to Los Angeles alone, he brought his girl, Evelyn Smith, and his gang with him. It didn’t take long for the gang to come to the attention of local law enforcement, and for six months cops tried unsuccessfully to catch the gang in the act. Shortly after the wounding of Officer Bandle, Sheriff Traeger received a hot tip about where the gang was holed up and he and LAPD Chief Oaks formulated a plan. An early morning joint raid was conducted by Sheriff Traeger and Chief Oaks at two locations. Swarms of deputies and patrolmen arrived at the bungalow in the rear of 1234 West 39th Street and at a rooming house at 533 1/2 South Spring Street. Under the direction of the Sheriff and the Chief of Police, Detective Capt. Home, Capt. Murray, Detective Sgts. Jarvis, Neece, Longuevan and Davis, and Deputy Sheriffs Sweezy and Allen took part in the raid. Arrested on suspicion of robbery were : Edward Burton; J.W. Gilkye; K.B. Fleenor; B.C. Beaucanan, and his wife; William R. Ryan; F.J. Ryan and his wife; and Evelyn Smith. Also at the bungalow was a burglary kit and a stash of weapons including three shotguns, two rifles, and half a dozen revolvers–a good indication that the gang was up to no good. The recent hold-up of E.E. Hamil and E.C. Harrison, collectors for the Puente Oil Company, netted the bandits $3875 (equivalent to over $56k in current dollars). Hamil and Harrison attended a line-up to see if they could identify any of the suspects as the man who had robbed them. They pointed at Edward Burton. Burton was released on $10,000 [equivalent to $145k in current dollars] bail while Sheriff’s investigators continued to dig into his life and the lives of his companions. No one was surprised to find that Burton was a career criminal with numerous aliases–among them, Charles Mullen. Burton/Mullen fit the description of the man who had shot Motor Officer Bandle; and the car found near the scene of the shooting was registered to Mullen. An unlikely coincidence. Evidence against the gang was mounting. They started to talk about hopping the next train east. Burton agreed that things were getting too hot for them in Los Angeles, but he said before they bid adieu to blue skies, ocean breezes and palm trees, they needed to pull just one more job. NEXT TIME: Shootout at Union Ice Company.